Edit: The official site is now live too with lyrics and samples of the full list of songs. 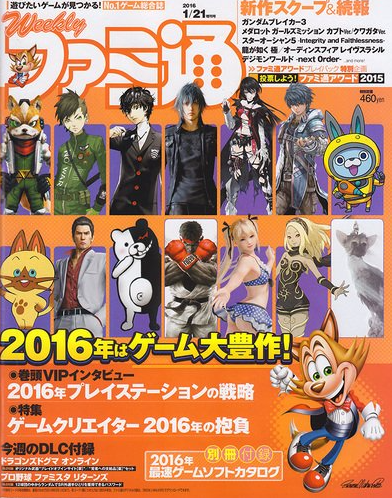 As I mentioned on Twitter last week, the 21st January 2016 issue of Weekly Famitsu magazine didn't include any new coverage about the upcoming Sengoku Basara: Sanada Yukimura-den game. Instead, KobaP participated in a two-page interview about game tie-ins which looked back at some of the memorable collaborations over the history of the Sengoku Basara series. KobaP mentioned that KobaP won't have all that many collaborations (in comparison, Sengoku Basara 4 Sumeragi had a lot) but they have some interesting things planned. He noted that he really wants to show off the fighting styles and voice actors for the new characters Sanada Masayuki and Nobuyuki. Coupled with his comments in mid-December I strongly suspect that at least one of the two new Sanada clan members will be playable in the new game; possibly both of them. 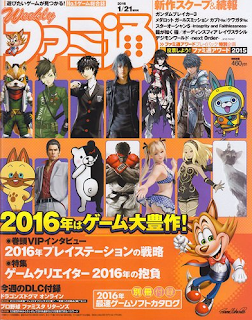 The usual pattern for new information is that Weekly Famitsu breaks it first then Dengeki PlayStation covers it the week after; if that holds true then I would guess we'll hear more on 21st January. However, this is purely speculation and nothing is stopping Capcom from suddenly releasing new information at any time. Hot on the heels of KobaP's interview, news broke the next day about a new collaboration with iOS/Android title Monster Hunter Explore. 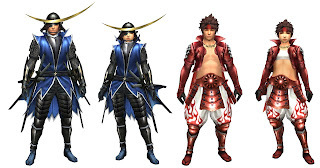 Fans of the game will be able to obtain special in-game equipment based on Sengoku Basara between 14th January and 29th January 2016. There will be four different three-piece armour sets available for player characters. The Azure Dragon's Armour (Blademaster) and Azure Dragon's Haori (Gunner) sets are lightning elemental while the Akazonae are fire. The armour sets resemble the costumes of Date Masamune and Sanada Yukimura from Sengoku Basara, of course. It will also be possible to obtain four weapons. There are one-sword and six-sword versions of Masamune's Kagehide blade, as well as dual and juumonji versions of Yukimura's Shura spears. The Butai Sengoku Basara 4 Sumeragi stage play is starting its run in less than two weeks too, and they've been regularly updating their website with pictures of the cast members in costume. Larger versions can be found on Twitter and Facebook. There are also a few brief video clips with interviews with the actors for Masamune, Yukimura and Motochika. 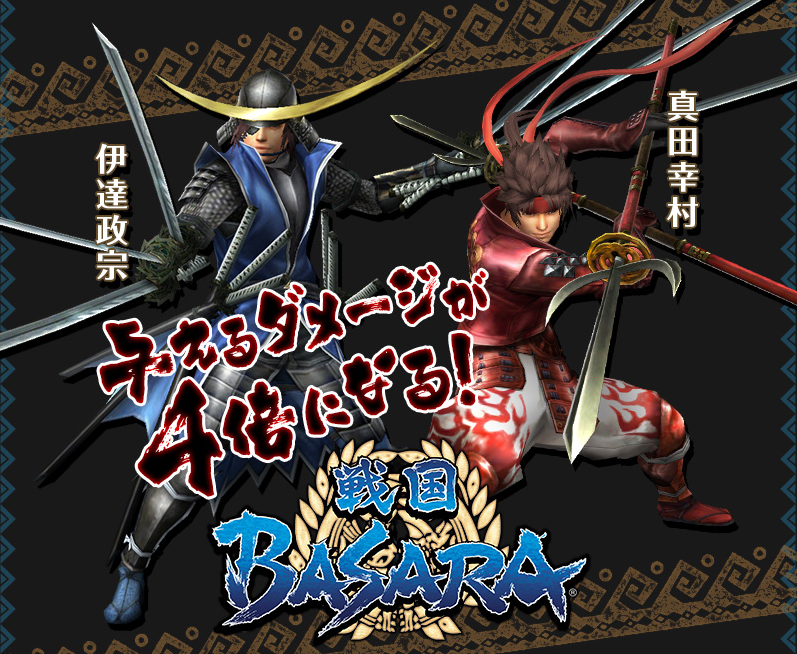 Speaking of the stage play series, the DVD release of Butai Sengoku Basara 4 has had a few problems as they have been unable to keep up with demand; even people who ordered as soon as the listing went live are still waiting for their copies. The Ace Shop staff have been very apologetic. I suppose that this means the release has been a success, even if fans are still waiting to actually see the show. Wow wow wow the vocals are great. I'm glad they took the time to remix the themes a bit themselves, like with the Dynasty Warriors theme vocal CD. Now they fit pretty darn good! Finally Masamune has his own party song - ideally this should be by his VA heh. In some cases I don’t think adding vocals added anything of value to the songs, but yes, Kasuga’s is nice. I also like the arrangment of Maria’s and the dude singing on Hanbei’s and Mitsunari’s too. Nobunaga’s is still a mystery. Happy new year crazy SB fans and don’t burn yourself out, Raindrops. This will never happen but it would be nice if this CD does well enough to spawn a sequel. Trying to imagine a vocal version of Muneshige's theme blows my mind. Since these themes seem mainly succesful (never was a fan of Kg's theme either) judging by the clips, I don't see why there absolutely couldn't be a follow up CD sometime. There are indeed many more characters themes which would be nice to hear. Just add some more of the top popular ones, et voila. Mitsunari's isn't his actual battle theme, but stage music - so a lot of remixes could be made. It's a shame Shima Sakon didn't get his own vocal theme, it could be a great song. I really want more news from Sanada Yukimura Den. They can only keep it secret for a couple more days now! Then we'll all find out how Nobunaga's works. The lyrics look promising (lol). For some reason I have set my heart on this week for the next release of information about the game. They might be focusing on the stage play for a couple of weeks, though. I'm glad someone agrees that Nobunaga's theme is pretty bad. :x I don't think they really decided what they wanted out of his theme- if they wanted to play up the planner Nobunaga or the demon king Nobunaga, and in general the lyrics did not sync with the BGM- it was almost like he was talking over it. Kinda wish they went with someone else, in such a case. I'm not fond of Rikyuu's at all either, they didn't remix the background music enough to really make it a good song to sing to, and, though perhaps on purpose due to Rikyuu's dual persona, the singing seemed kind of atonal, and at times just seemed like melodic talking as well.... and while Yoshiteru's is okay the BGM AND the singing seems kind of weak for something meant to be the magnanimous Yoshiteru's song. I like the others though! I kind of have to disagree on the general singing being not too good, as I REALLY love the three girls' songs and think they're all lovely. Raychell with Kasuga's theme is pretty much perfect (the day I got it I basically listened to that theme on loop for an hour). The other two are really good too- Maria's in particular made me wanna dance! Yukimura's and Keiji's are great too as is the anniversary song. I can sorta see what you mean for the others though- not great, but not /bad/ either. Like, Hanbee's in particular is great most of the time, but the singing gets pitchy/nasally at times which is a bit disorienting. Yeah, it isn’t a terrible album or anything, there is some mediocre singing/arrangment and also catchy songs. It’s better than I feared it would be. I found Shin Minchul’s sometimes weird nasal pitch on Hanbei’s theme charming, lol!